Social media oAuth features such as Facebook or Twitter Connect allow you to create more of a Single Sign On (SSO) concept, where the barrier to entry is reduced by letting people use existing account credentials to access your service. 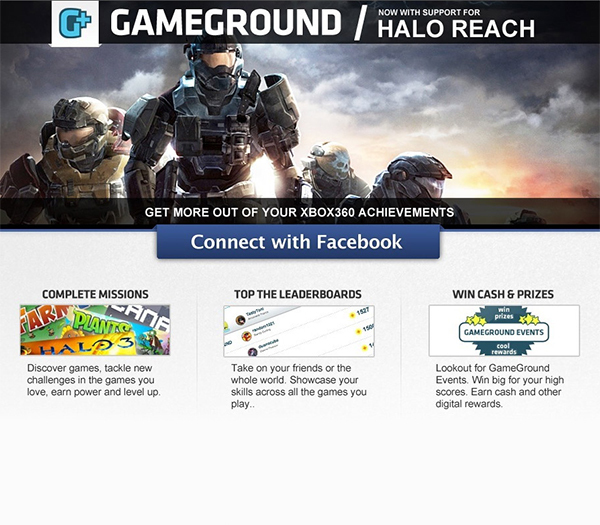 Know thy audience: The Gameground idea is all about socially connecting your game experience, so using a Facebook login is a great way to relate to your target. Speak their language: The mission descriptions can probably be recognized by players of the game – which will get them excited about the reward points they can earn. Tapping the arcade mentality: This is a “Like” for the concept – as it seems to imply that there will be high score tables (like on old arcade games). Needs a clearer statement of what it does: After reading the whole page I don’t really get it. How does it connect and enhance your gaming experience? Example rewards: What can I use the reward points for? Show me something I’d like to aspire to and I’ll be more likely to try it. Clarify headline: “Complete missions and discover what’s next in Halo Reach” – implies that I might actually get an in-game special/secret bonus. Is this true? I thnk a little more detail could help here. Leaderboards: It says you can beat high scores and compare with your friends. How? Will there be an online (Facebook?) leaderboard. Showing a screenshot of this in context or explaining how you’ll be able to brag to your Facebook friends would be enticing. Hero shot: This design has a much stronger hero shot image which screams Halo. 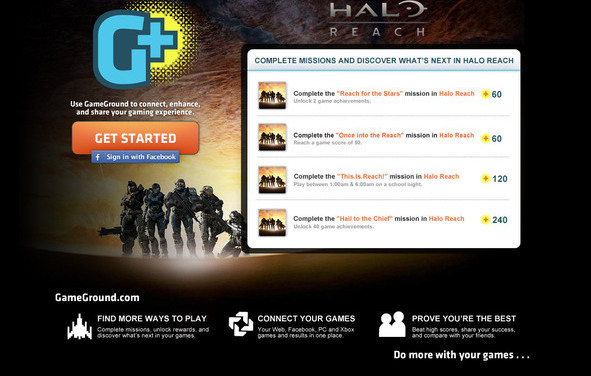 Branding: The top bar now includes a stronger sense of who the company is (GameGround) and the “now with support for Halo Reach” implies that they do similar cool stuff for many games. Better explanation of concept: There is a slightly improved sense that you can unlock extra stuff/levels in the game – but still not much to explain how. Competition: The leaderboard (at least I predicted that one) gives a sense of competition between you and your friends. Cleaner design: The design is a lot simpler. Number of CTA’s: There is only one really clear thing to do which appears good at first (click the Facebook button). But the three feature boxes at the bottom get negative points as they all link to the same page as the Facebook CTA. I’d prefer if they launched small modal dialog windows (Lightbox style) that answered some of the questions people will have about the core features without removing them from the page or taking them to content they weren’t expecting.